Plan A: Use my only real French tart pan my mom gave me as a 20-something to make David Lebovitz's Lemon Tart to take to an all French event for Thanksgiving. The recipe seemed like the sort of recipe someone like me could do. No machine involved, no rolling pin, no freezing the crust before baking. It was all done by hand, including patting out the dough into the pan. The process was a little unusual, even David was freaked out by it, but he said it worked and his photos were, of course, inspirational. After baking butter, sugar, water and oil in a Pyrex bowl for 15 minutes at 410 degrees and carefully dumping a generous cup of flour into the boiling, browning mixture, the dough did come together with very little stirring on my part. But as he said, you have to wait until it cools off enough to pat it out. Unfortunately I learned my authentic French cooking gear was larger than a 9 inch round tart pan, oh well. Plan B: This 9-inch cheesecake pan with a removable bottom was the only 9-inch pan I have and I still wish I had more dough. I couldn't get to a nice 1/2-inch fluted rim like David did and had to make do with the barest uplift on the edges. Nor did I have enough dough to save a little as he suggested to fill the inevitable cracks in the bottom. I sincerely hope the lemon curd is so heavy it can't leak down into the pan underneath the crust and undermine all my efforts. 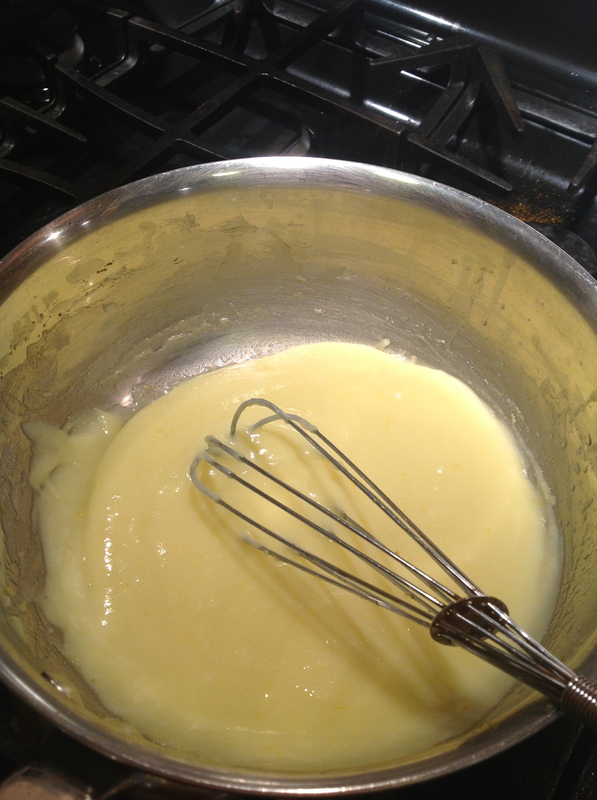 Making lemon curd is not difficult! That is the second reason I choose this recipe. 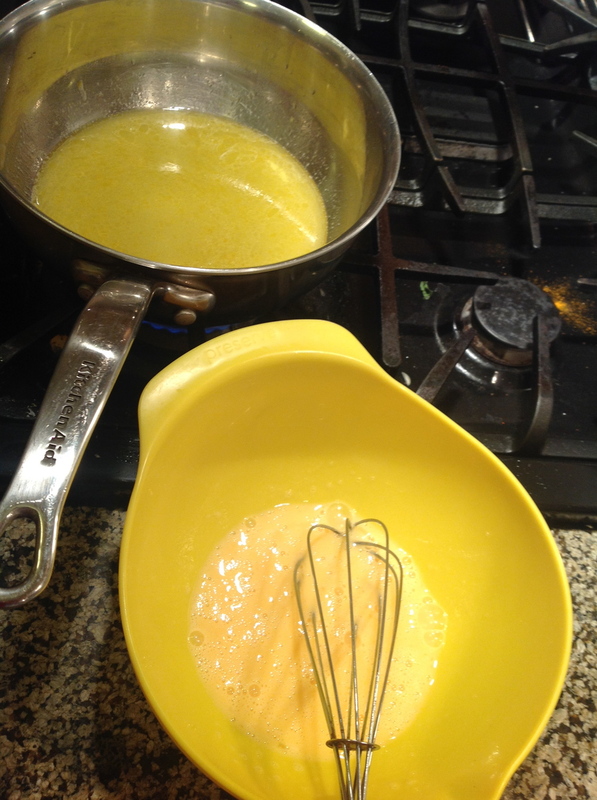 The only possible fatal error would be adding too much boiling hot lemon sugar juice into the eggs. Having done that before, I poured just a little bit and beat it a lot and was successful. 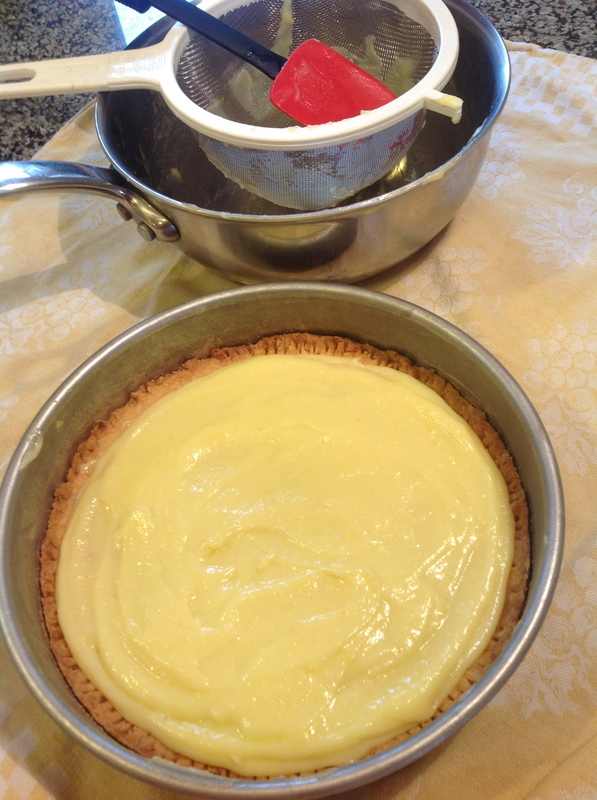 The curd was cooked stirring constantly until it thickened over low heat and then strained right into the cooled tart crust. David likes things strained and It's an easy step to get a superior creamy result, so I say don't skip this step. Baking five more minutes to set the curd didn't change the look of it. This is the final tart ready to go the event. I was really pleased with the way it looked, traveling did not make a ripple and it held together nicely when sliced. The flavor is refreshing with a prominent lemony, citrus tang, not sweet, but "tart". I will make this many times.